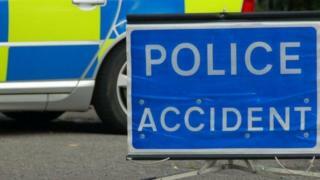 A number of people have been injured after a multi-vehicle road crash in County Antrim. The M22 northbound is closed between the Ballygrooby Road and Moneynick Road junctions near Randalstown. Three people are understood to have been taken to hospital after the crash that happened at about 19:00 GMT on Friday. Motorists are advised to expect delays and seek alternative main routes for their journey.